Colour theory is a crucial part of makeup, especially if you are in the business of trying make a portion of the face out of rubber and make it look like it belongs there and is the same as the real skin which surrounds it. 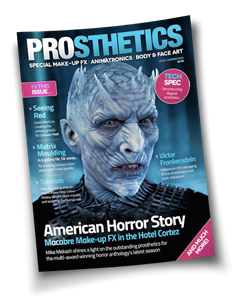 This podcast accompanies the article we wrote for Neill Gortons 'Prosthetics' magazine, jam packed with tutorials and great behind the scenes goodies for all things prosthetic! This is especially true when mixing your skin tone into your appliance material in the case of silicone or gelatine appliances. The materials are different, but the principles of colour theory and how to create skin tones remain the same. This colour is IN the pieces rather than ON them. We have gone on a fair bit in the past about the importance of colour and colour theory in posts about using photoshop to match skin tones, and 7 tips for painting skin tones. The reason...? Because it really matters and it's actually rather simple. It's important to get the base tone of your appliances right, as you don't want to make things harder for yourself later by creating an appliance which fights you all the way because of poor base tinting. It's very frustrating to have to use the makeup to 'correct' a badly or inappropriately coloured appliance when you can get the base tone to do most of the work for you. ....and email your questions and feedback to us at stuartandtodd@gmail.com. Todd and I have been chatting, as we both let the blogging slip because of work - so we are back with a plan to do more podcasts to give responses to email questions on a regular basis. So, we caught up in this podcast to get the ball rolling again - listen or download it from here. It was recorded on Friday 13th....so it isn't about the movie Friday the 13th, so sorry to the Michael Myers fans.....this time we're talking plaster heads and master moulds, plastiline and apps to help design. This time we take an interesting approach to capturing the tissue damage caused by gunshots and being able to safely recreate the three dimensional effects by moulding the results. It's a novel way of testing out some theories. All we need is some sides of meat, a range of firearms, some privacy and an afternoon in the Colorado woodlands. All in the name of FX reference. Fun times! Lifecasting is an essential, basic skill used in makeup effects and prosthetics - whether to create a custom fit appliance or to make a lifelike prop without sculpting from scratch. In this podcast, Stuart & Todd share cool tips and tricks about this important yet varied subject. This podcast is the first joint blog post venture with Stuart Bray and Todd Debreceni. Todd is author of 'Special Makeup Effects For Stage And Screen', what many consider to be the modern makeup FX bible. Stuart Bray is a working makeup FX artist with many years experience. Credits include 'Saving Private Ryan', 'Shaun of the Dead', 'Dr Who' and more recently 'Game of Thrones'. This one is all about the glues and removers we use with prosthetics. One thing is for sure, people get confused about which is what and why. This podcast breaks it down and you can be assured its really not as complicated as it sounds!